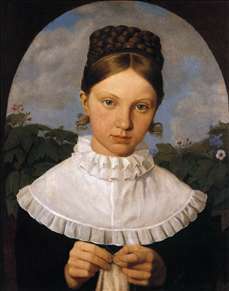 German painter, known for his genre and history paintings. After training (1813-17) under Peter von Langer (1756-1824) at the Akademie der bildenden Knste in Munich, he painted religious subjects under the influence of Peter Cornelius. In 1821 he joined the Lukasbrder, and the circle around Crown Prince Ludwig I of Bavaria, in Rome. Apollo among the Muses (1824; Munich, Neue Pinakothek), painted for Maximilian I, shows Hess to be among the most gifted of the German artists working in Rome. The influence of Raphael, glowing but carefully harmonized colours, gliding figures and drapery animate this early masterpiece. Among other important works from this time are exquisitely detailed and colouristically sophisticated, intimate character portraits with early Renaissance settings, such as that of Marchesa Marianna Florenzi (1824; Munich, Neue Pinakothek), as well as fresh and lively Naturalist landscapes from the environs of Rome, for example Campagna Landscape near Ponte Nomentano (1821-26; Hamburg, Kunsthalle). 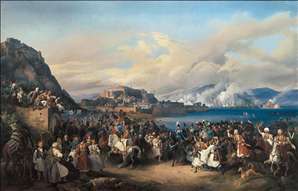 Hess was a popular painter of battles and historical scenes and painted extensive battle cycles for Munich s King Ludwig I, as well as for Czar Nicholas I in St. Petersburg. Today his monumental scenes often seem to be overtly theatrical; however, on closer look, they hold a certain fascination due to their very precise attention to detail. See more details about "Portrait of Fanny Gail"
See more details about "The Entry of King Othon of Greece into Nauplia"